November hiring maintained solid momentum, providing further evidence that the U.S. economy is on sound footing as it heads into the new year. In conjunction with the upward revision of third quarter GDP to 3.6 percent and a steady stream of positive economic news, the prospects of the Federal Reserve easing its bond purchases soon, perhaps as early as this month, have risen. The challenge for the central bank in the year ahead, however, is to reduce stimulus in a way that will minimize the possibility of a sharp rise in interest rates and disrupting economic growth. U.S. employers hired 203,000 workers last month, including 196,000 positions in the private sector. With the increase, more than 85 percent of the jobs lost during the recession have been restored. Holiday-related hiring was notable in November. Retailers added 22,300 positions, primarily at larger national and regional chains. Additional staffing by trucking and parcel delivery services also contributed to a gain of 30,500 positions in transportation and warehousing, while restaurants and bars geared up for holiday parties by adding nearly 18,000 workers. Also, a gain of 16,400 temporary workers was recorded as retailers and other employers added staff to handle higher seasonal business volume. 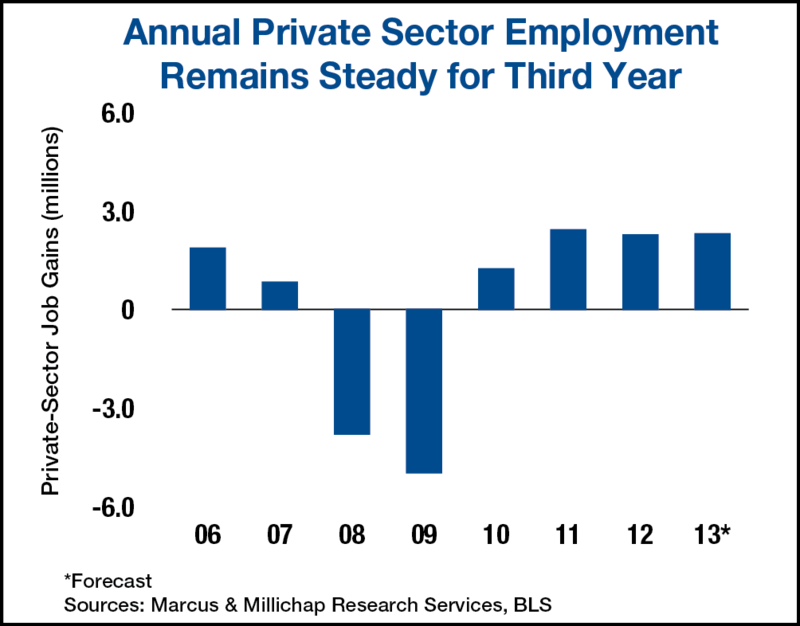 Overall, eight of 10 private-employment sectors either expanded payrolls or maintained staff levels during the month, with only the financial services and information sectors shedding workers. Government staffing expanded during November for only the fourth time this year. All of the 7,000 added jobs were at the state and local levels, as sequestration-tightened budgets continued to shrink federal payrolls. A recovery in the housing market and strong growth in retail sales have lifted revenues for many cities and municipalities and helped to strengthen budgets. Year to date, local governments have added 57,000 workers, a drastic improvement from a loss of jobs during the first 11 months of 2012. Full-time office-using employment continues to recover, as employers created 14,600 jobs last month and nearly a half million positions thus far in 2013. With the gain last month, seven of eight full-time office positions lost during the recession have been recovered. Since employers resumed hiring in early 2010, vacancy has declined 120 basis points to 16.2 percent and more than 189 million square feet has been absorbed. An additional decline in vacancy is projected in 2014. Economic growth and expanding payrolls continue to drive consumers to shopping centers across the country. On a year-over-year basis through October, retail sales are up 3.9 percent and holiday projections remain strong despite the weaker than anticipated Black Friday results. This year, growing retailers will occupy an additional 77 million square feet of space. Combined with only nominal completions, the vacancy rate will decrease 50 basis points to 7.6 percent, or 110 basis points less than the peak level posted during the downturn. This entry was written by marcusmillichap, posted on December 6, 2013 at 10:52 pm, filed under Uncategorized and tagged CRE. Bookmark the permalink. Follow any comments here with the RSS feed for this post. Post a comment or leave a trackback: Trackback URL. Based on the fact that 86K of the 193K jobs created were seasonal or part time, I have to wonder if the news really is as good as the article suggests. I would imagine that any year would see similar seasonal and part-time staff hired during this time of the year.